Okay, more than five actual minutes. But isn’t that catchy? In reality, however, it was “gluten-free party that I should have prepared for, but had no time during the week, and was getting back from a kid birthday party, and had to also rely on the rest of the family to prep a spread.” But that is just not snappy. 1. The crudite and dip. Yes, so many dips are not gluten-free. I make one that is amazoids, but on this particular day I found an onion dip that was gluten-free and purchased it. Add carrots and cucumbers, and you’re in bizness. 2. Gluten-free crackers, cheese, proscuitto. I’ve mentioned my love for Myrna’s Skinny Crisps before, and they truly do win over gluten-loving hearts and minds. Throw down a variety of lovely cheeses, and you look like you’re throwing a normal get-together. 3. The Burrata Special. On this particular night, we had guests from out-of-town. Paris, in fact. So while I did feel a little weird about throwing my American cheese around, I always find this burrata trick is a winner. You just put your burrata in a bowl, split it down the middle, drizzle olive oil, truffle oil, and salt and pepper that sucker. Delish. 4. Corn and arugala salad. I love this salad so much I would totally marry it. You can pick this up at Whole Foods, or you can make it like this: Cook 3 cobs of corn and let cool. Once cool, slice corn off cob into bowl, add arugala, add thinly sliced red onion. Dress with olive oil, white vinegar, salt and pepper. DONE. 5. Popcorn. You’ve got this. 6. Udi’s Gluten-Free Margherita Pizza. If you have a couple of gluten-free pizza crusts handy, this is a snap. Buy pre-made tomato sauce, basil, and slice up some mozzarella. Throw it on the crust, and bake according to instructions. You can also cut this into small pieces and serve “pizza bites.” Shazam. Go forth and hostess, my gluten-free friends. P.S. – For those of you who were able to come to my reading at SXSW, or for those of you who sent your boyfriend (Kate! Whoever you are, you are RAD), THANK YOU ONE MILLION TIMES OVER. It was super fun, and I enjoyed talking to every single one of you. 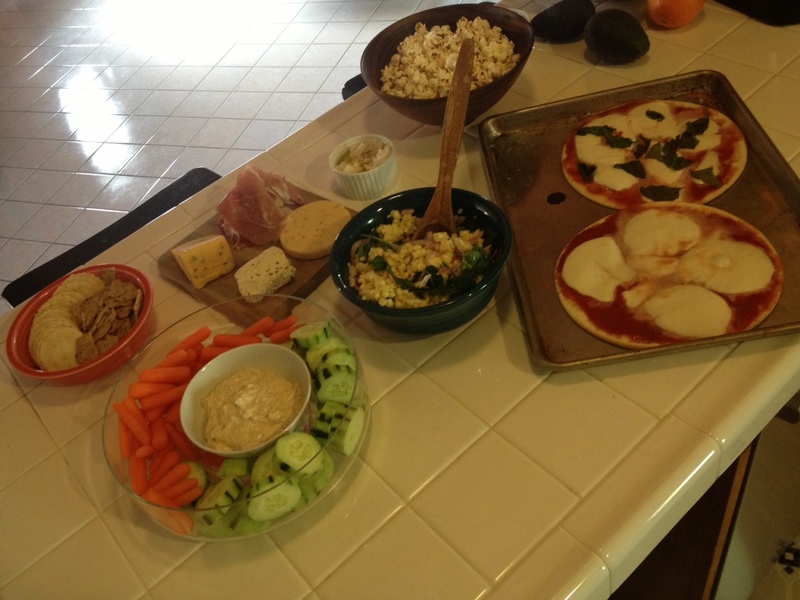 Tags: gluten free pizza, gluten free recipe, gluten free snacks, gluten-free party. Bookmark the permalink. What’s the best Myrna’s flavor? They look so hearty. I like the sesame ones, Molly. But honestly, they’re all super delicious. The onion flavor is also great if you’re pairing it with something mild.